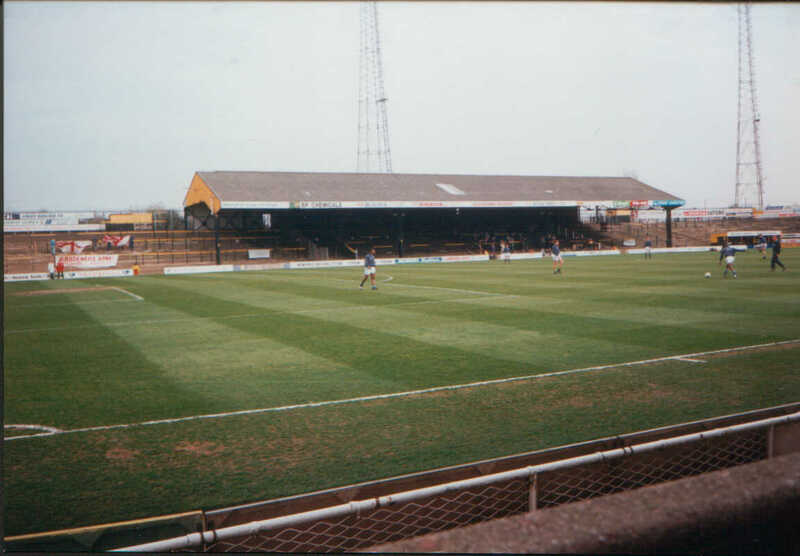 1: Boothferry Park was home for Hull City from 1946 until 2012. Planning originally started in 1929 but delays due to legal issues and World War 2 meant that it did not come to fruition for quite some time. 2: The ground earned the nickname 'FER ARK' by fans. This was because disrepair caused the most of the illuminated 'BOOTHFERRY PARK' to fail due to the club not replacing faulty bulbs. 3: At closing, the ground's capacity was just over 15,000. It had seen a record attendance of 55,019 for the 1949 clash with Manchester United. 4: Due to financial issues the club allowed a supermrket chain to build a store on it's land. 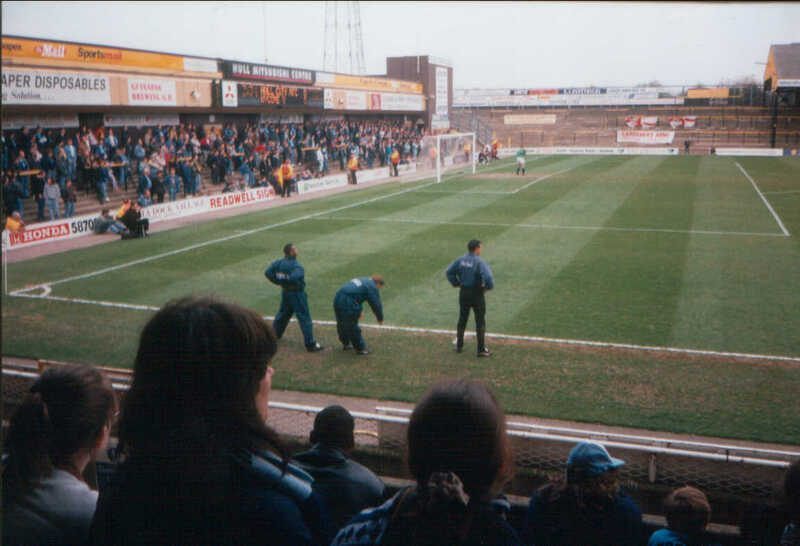 This became the away end with a few steps of terracing in front of it. It was initially a store for the defunct chain Greenways, changing to a shared store between Kwik-Save and Iceland with both staying open some 6 years after the ground was demolished. 5: The ground gained floodlights in 1964, with the opening match being marked by a 7-0 win over Yorkshire rivals Barnsley. 6: An international game was played the the ground in 1972. The European Championship Qualifier between Northern Ireland and Spain ended 1-1 and was watched by 20,085 fans. 7: The ground even had it's own train station - known as Kempton. The small station linked to the main station in Hull to transport fans to and from the game and opened in 1951. 8: The final match at Boothferry Park came in 2002. The Division 3 clash between Hull City and Darlington ended with a 1-0 win for the visitors. 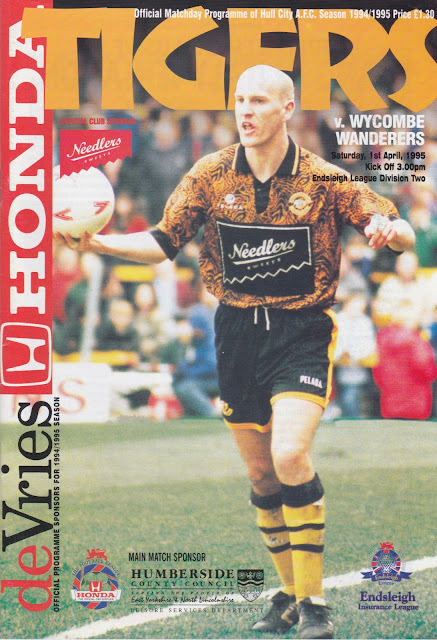 My only visit to Boothferry Park was in the last rites of Martin O'Neill's magnificent reign at Wycombe Wanderers. It was early April and we were well placed for a shot at the play offs, even if there was only one automatic promotion place and 4 playoff spots, this owing to the self serving Premier League's reduction from 22 to 20 teams. It was a fairly bright, warm day that me, my dad and my brother took the Independent Supporters Club coach to Hull for this game. On the way we stopped at a “members only” Irish Club near Doncaster Rovers' old Belle Vue Stadium. What a shame that all 35 of us non Irishmen had forgotten our membership cards for the Irish Club in High Wycombe! However the management decided that us adding to their profits would not be a problem on this occasion. I can't say it was the greatest watering hole ever, and nowadays the Indies will go to nothing less than a real ale pub that serves good food. Well this place had Guinness and dry roasted peanuts, but that was about it. As for the game it ended 0-0, with not much to write home about. One thing I do remember is that it was the Football League debut of 21 year old Terry Skiverton, who went on to become Yeovil Town Manager. At the time he was on a months loan from Chelsea. The result, although not a bad one at a venue that is quite hard to win at for the away team, conspired to leave us in 6th spot at the end of the season. Good enough for a play-off spot in any other season, but thanks to the Premier League's self-interest, not this one. It was our highest ever league placing and one that we are unlikely to better, we certainly haven't come anywhere close since. 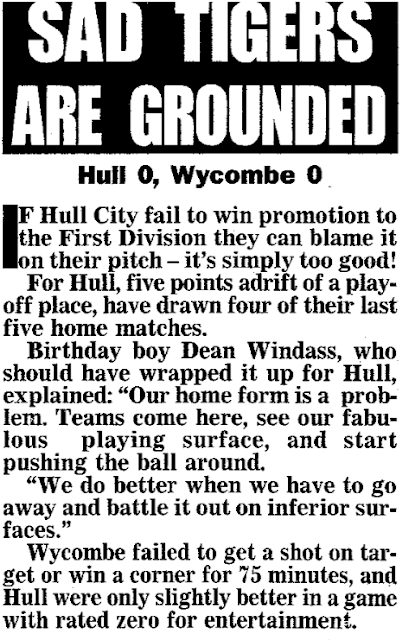 Hull meanwhile went into freefall and financial troubles, nearly dropping out of the league and close to being wound up on a few occasions. Times have changed dramatically however, they have a fantastic new ground and even spent time in the Premier League. 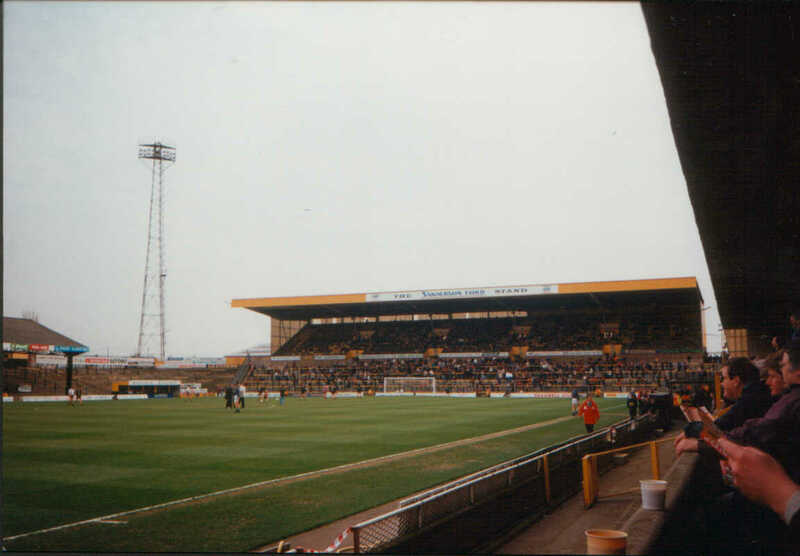 BOOTHFERRY PARK was a classic ground, though it was showing its age by the time I visited. The away end was a supermarket with a few steps of open terracing in front of it. To it's right was where I sat – the main stand with a section of seats for the away fans, the stand having seen better days. The same could be said for the terracing opposite which had been partly closed down due to health and safety rulings. The other goal end was quite impressive though – a huge 2 tier stand with seats in the top tier and terracing at the bottom, easily the best part of the stadium.